This one is simple – use milk jugs! Use sharpie marker and make a face. Poke a hole in the back. 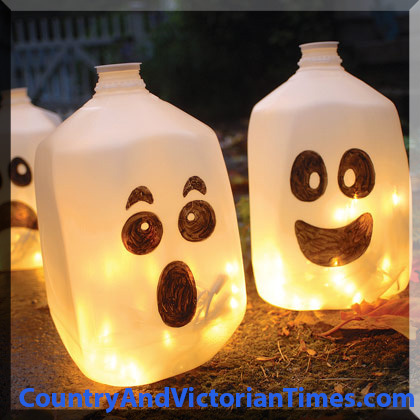 use a string of white lights and push about 25 lights into each jug. Place ghosts along front of a house, down stairs. Light pathways to help trick or treaters find the way to the door. This entry was posted in Crafts ~ DIY ~ Projects, ~Halloween and tagged candy, decoration, decorations, trick-or-treat, ~Halloween. Bookmark the permalink.